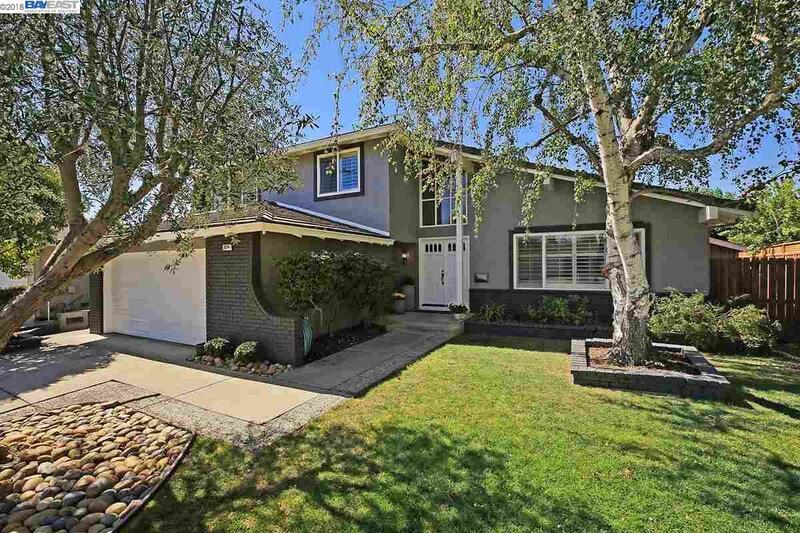 This beautiful home is located in the desirable Pleasanton Meadows neighborhood. Premium location, with end of court access through the greenbelt to community cabana club pool, tennis courts, park, & Fairlands Elementary School. This home features a new 3 tone contemporary painted exterior, spacious indoor living area w/soaring ceilings, bright kitchen w/ recessed lighting & fans, beautiful plantation shutters, & luxury dark walnut laminate plank flooring throughout. Upgraded textured rounded walls, & textured ceilings. Nicely hidden roomy attic/storage space off the master bedroom. Spacious backyard oasis with raised covered patio, built in BBQ & bar, stamped concrete & pavers, gas fire pit area, & garden bed. HOA is paid annually.